For those of you that have never visited our town during the round-up. If you have never visited our town, and are looking to visit , let us be the first to say thank you and welcome. Our town during this event tends to be a little bit busy and hectic. We go from a population of 11,000 people, to a population of approximately 40,000. And if your visiting us for you first time, it can be quite confusing. Here's where we will try to help. 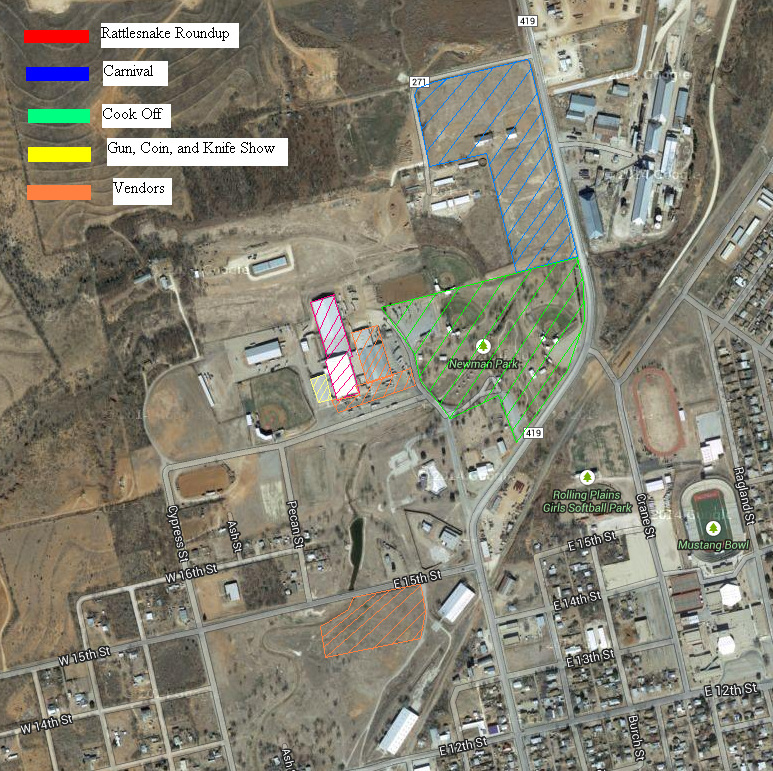 Everything dealing with the roundup is located inside and around the Nolan County Coliseum. As you're driving in, you will encounter a lot of traffic (at least it's a lot of traffic to us). First things first. Where is the roundup? We are located in and around the Nolan County Coliseum and Newman Park (Google Maps). I've found you, now what? First off, you need to find a parking spot. The area in front of the coliseum, while being free, is usually taken and not readily available. Other areas of parking around the coliseum ranges from free to $8 it just depends on the distance you are from the coliseum. Be careful, during the roundup, some of the 2-way streets become 1-way. The police and support staff will point you in the correct direction. Ok, I'm parked, next? After your parked, there are a plethora of vendors. You may have noticed a large area of vendors as you drove in. They are located on the south side of 15th street which is approximately 5 blocks south of the coliseum. Another set of vendors are located outisde the coliseum, and also inside the Ag barns next to the coliseum. The vendors outside are mainly our food vendors and have everything your growling stomach could want. (think roasted corn, or fried alligator on a stick). Inside the Ag barns are more vendors and the have everything to fill your Christmas list. What's that lovely smell? Depending on your location, you might be smelling the smoke from the cookers at Newman Park. Don't be shy, walk on over and say Hi. If you want to dive into the Texas cuisine, you can always volunteer to be a meat judge. To do that all you need to do is talk to the people in charge of the cook off, and they will tell you what you need to do. To find these people, just make your way to the Jaycees cook shack (it's on wheels), or go to the Chuck Wagon Gangs' building (thank ya'll for donating it), which is located across the creek. If you are in doubt, just ask any cook off team and they will point you in the right direction, again, don't be scared, they are friendly. Now what? Well, if you're ready, let's enter the coliseum to see the roundup. Normally there is a long line to enter, so don't be alarmed. What will I see? Alot. Things inside here are kinda separated. It is like a 2 story building with most of the attractions on the 1st floor. You will enter through the front doors of the coliseum which is essentially on the 2nd floor (say hi to Charlie in the ticket booth) . Once your inside, it's up to you where to go. The things you will see inside will be more vendors, the skinning pit, weigh in, research, milking pit, Official Rattlesnake roundup apparel, and Safety Demonstrations by David Sager. If you've already done everything and still hankering for more. We provide night time entertainment, but at a different location. Every Friday and Saturday night of the Roundup, the Jaycees hold a dance at the "﻿Jaycee Barn﻿" at 307 West 4th. Past entertainers include Josh Abbot, Bart Crow, Cory Morrison, Mike McClure, JB and the Moonshine Band (not KC and the Sunshine Band, Rodney). Bands are normally announced a month or two in advance.